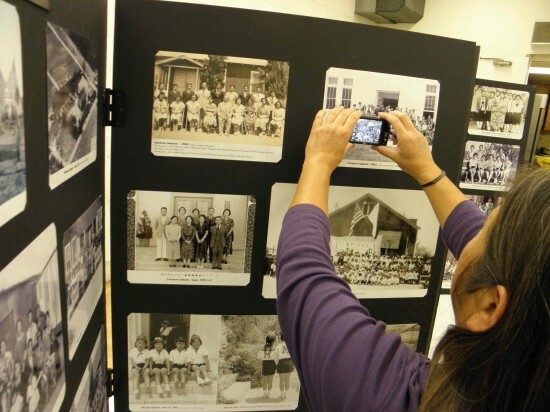 Former Moneta, Gardena and Compton students and teachers searched for their class photos. GARDENA — The 100-year legacy of the Gardena Valley Japanese Cultural Institute’s Japanese Language School (Nihongo Gakuen) was celebrated Nov. 10 at an event that brought together more than 150 people, many of them former teachers and students. 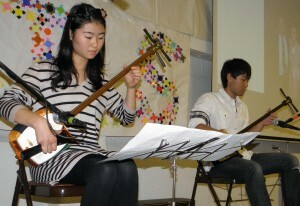 Siblings and former gakuen students Airi and Ken Dekitani played the shamisen. One side of JCI Hall was filled with school photos spanning the past century. Attendees found photos of themselves and their friends as youngsters, and took photos of the photos with their cell phones. Memorabilia included the Compton Ryoh Gakuen Trophy, presented in 1941 to Gengoro Tonai of San Pedro for designing, constructing and donating a Japanese garden, complete with waterfall, lake, bridge, plants and koi, to the school. Moneta Gakuen was established in 1912, Gardena Gakuen in 1915 and Compton Japanese Language School in November 1924, led by former Gardena Gakuen teacher Koshiro Endo. Moneta Gakuen moved to the JCI’s current site on 162nd and Gramercy in Gardena in 1935. After the wartime internment, during which the schools were shut down, Endo Memorial (Compton) Gakuen was formed in 1949. 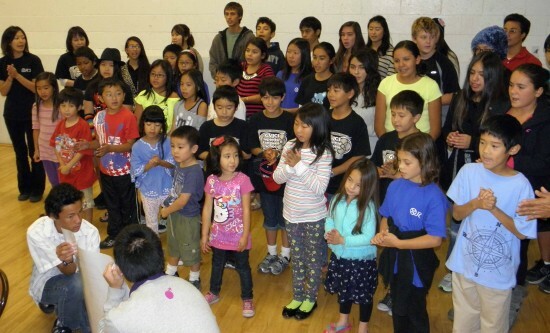 The Japanese Community Center re-chartered as Gardena Valley Japanese Language School in 1967 and as the JCI in 1968. 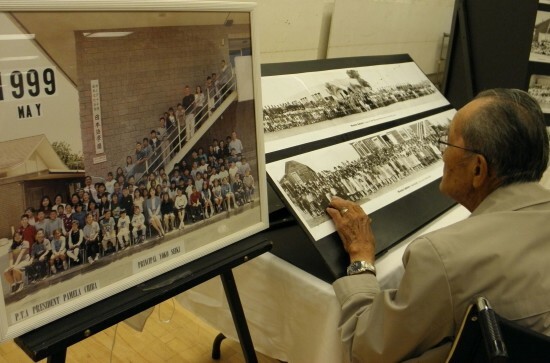 In 1970, discussions began on establishing a school encompassing Compton, Endo Memorial, Moneta and Gardena, and GVJCI Japanese Language School was established in April 1971 with Koji Endo as its first principal. The Moneta Gakuen building was destroyed by fire in October 1973, and a new building, the current JCI Hall, opened in October 1976. Left: Deputy Consul General Masahiro Suga. Right: Jeff Murakami, GVJCI board member and 100 Legacy Committee chair. The committee received hundreds of photos from people in the community and compiled “hours and hours of video … interviews with dozens of very interesting people with interesting stories about the last hundred years,” Murakami said. In order to accurately read and translate prewar records in Japanese, including Rafu Shimpo articles, a researcher from Japan was brought in — Hiro Watari of Kyoto University. JCI Executive Director Alison Kochiyama commented, “This 100-year legacy project has been extremely valuable to the JCI in so many ways. We were able to uncover and bring more clarity on our early history and the relationship with the Moneta Gakuen and Gardena Gakuen, who we owe our existence to. And we were also able to connect with the people who are part of that history, the staff and students and family members, capturing their contributions to the story as well. 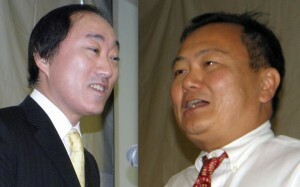 Left: Larry Hada, GVJCI Japanese Language School principal. Right: Alison Kochiyama, GVJCI executive director. Larry Hada, current principal of the school, related his personal history: “My mother attended Compton Gakuen and I myself was a student there. Remarkably, somehow I graduated in 1970. My parents and grandparents tried to speak to me as much as possible in Japanese to help me learn at home … However, the phrases I remember the most were ‘yamenasai,’ ‘stop that,’ or I guess the time I needed to always be on guard was when they added … ‘bachi ga ataru yo’ (if you do something bad, something bad will happen to you). For many years I felt that the purpose of them sending me to Japanese school was so they could scold me in public and no one would understand what they were saying. Left: Former student Helen Ota led a sing-along of Japanese children’s songs. 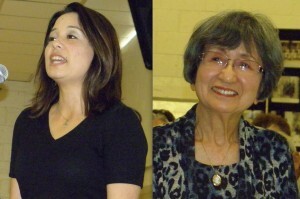 Right: Yoshiko Endo was thanked for her family’s contributions. Murakami did a roll call of attendees who were former teachers and students or surviving family members. “We’ve had relatively good success in terms of trying to find folks from all those different schools over the years, especially since two of the schools ended before the war,” he said. Special recognition was given to Yoshiko Endo, who taught at both Compton schools and then JCI. “Her husband, Koji Endo, was also principal at the time when that transition took place back in 1971 … We certainly wouldn’t be here today, in this property at the JCI with the language school, if it wasn’t for Mrs. Endo, her husband Koji and her family,” Murakami said. 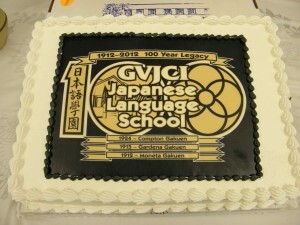 A cake with the 100-year legacy logo designed by Alvin Takamori. A group of current students sang the JCI school song and danced the “Tanko Bushi.” Two former students, siblings Ken and Airi Dekitani, played “Koujou no Tsuki” on shamisen, and the brother played “Tsugaru Jongara Bushi” solo. Former student Helen Ota, a member of the Grateful Crane Ensemble, led the audience in singing two popular children’s songs, “Furusato” (Home) and “Haru ga Kita” (Spring Has Come), with piano accompaniment by Scott Nagatani. The lyrics were provided. Following lunch, a video featuring recollections of former students and teachers was shown. Murakami emphasized that the committee is still collecting photos and memorabilia. Call (310) 324-6611 or visit http://jci-gardena.org. 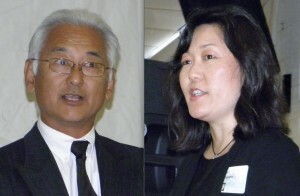 The event was sponsored by the Yoshiko Hayashi family, including daughter Brenda Ota of Sendai and son Brian Hayashi of Kyoto-fu, and in remembrance of parents Nobuichi and Tsuchie Wada and son Kenny Hayashi; Harold Takashi Kobata of Moneta Gakuen and Compton Gakuen, in remembrance of brother Edward Hideo Kobata of Moneta Gakuen; and the Japanese American Historical Society of Southern California. The event was a reunion for people affiliated with the language schools. Current students sang the JCI school song. It is certainly a noteworthy achievement to have run any language school for a century, especially if you consider that the history of language teaching is comparatively short. So congratulations to Nihongo Gakuen! I would be really interested to hear about what sort of improvements Nihongo Gakuen has been able to implement in its delivery. We have seen some improvements in delivery world wide but the outcomes have not noticeably improved. We still have shamefully low rates of success in second language learning in all countries, especially if you compare that with the extraordinarily high rates of success in learning a first language!